Metallic Paint,8in Capacitive Touch-Screen,Alloy Wheels - 18in Helix 10-Sp. Silver,Alloy Wheels - 18in Helix 10-Sp. Gloss Black,Heated Front Screen and Washer Jets,Bluetooth Telephone Connectivity,Cruise Control,Digital Audio Broadcast (DAB) Radio,Dual - Zone Climate Control with Front Deployable Vents and Row 2 Air Vents,Electric Windows - Front and Rear, with One-Touch Open/Close and Anti-Trap,Front Parking Aid,Heat Insulation Glass, Green, All - Round,Heated Front Seats,Hill Launch Assist,InControl Touch (SD) Navigation, SD Card Navigation with Dynamic Route Guidance and Low CO2 Routing,Jaguar Smart Key System - Keyless Start,Jaguar Sound System (80W), Audio AUX-IN, IPod Integration, Dynamic Volume Control, Bluetooth Streaming and AM/FM Radio, InControl WiFi,Jaguar Voice,Passive Front Head Restraints (Whiplash Protection),Perimeter Sensing Alarm,Rain Sensing Windscreen Wipers,Rear Parking Aid,Tyre Pressure Monitoring System (TPMS),Upholstery - Perforated Taurus Leather Seats,WOW...Gorgeous vibrant Firenze red high gloss metallic paint really stands out with the sport black accent pieces from the sport trimming, Sat with 18'' Helix alloy wheels gives a sports executive exterior finish. While the interior is finished in anthracite and red heated leather upholstery give an individual look with the sports black headlining. In built colour screen navigation with parking sensors blends nicely into this dynamic executive saloon. 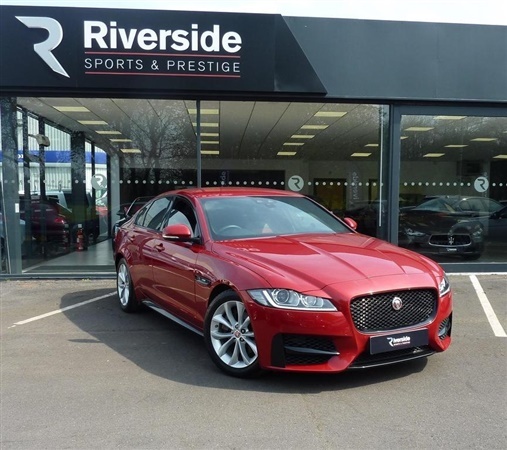 MOT runs into next year and service carried out in April with the backing of supplied with 2 keys and 6 months warrantyWelcome to Riverside Sports & Prestige Wakefield part of the Riverside Motor Group. Established in 1982 and now with 6 locations across Yorkshire, we are a privately-owned and run business with an absolute focus and enviable track record for outstanding customer service. For more than thirty years, our team has worked hard to service our customers through sales and aftersales care and we are exceptionally proud of the high percentage of repeat business and recommendations we enjoy each year. We have excellent relations with our vehicle manufacturer partners who recognise our high standards in customer care. Riverside is registered with the Motor Industry Code of Practice and we are a member of the West Yorkshire Trading Standards Motor Trade Partnership. We look forward to welcoming you.' Please call for More Details on *** and ask for the Sales Department.